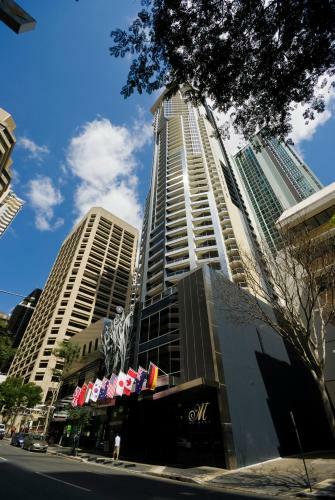 Located in the heart of Brisbane, M on Mary Apartments offer self-contained accommodation with cable TV and DVD players. It features an outdoor pool, a fitness centre and a sauna. M On Mary Apartments are just 5 minutes? walk from both the Botanical Gardens and Conrad Treasury Casino. Queen Street Mall is a 10-minute walk away. All air-conditioned apartments include laundry facilities and a fully equipped kitchen with a dishwasher and microwave. Most apartments have a separate study room, a private balcony or a private jacuzzi. Please note that the credit card used to book this hotel will be charged when making this booking. If the credit card payment is declined, the booking will be cancelled. Please note that a 1.5% surcharge applies for payments made with Visa and MasterCard credit cards. Please note that a 3.5% surcharge applies for payments made with American Express and Diners Club credit cards. Please note that a credit card pre-authorisation and a copy of a valid photo ID in the name of the guest is required at check-in. Check in is not permitted without a valid credit card and photo ID. All children must be accompanied by an adult of at least 18 years of age. Please note that this property has a strict "No Party Policy". Violation of this policy will result in eviction from the building and additional cleaning charges. Guests are kindly requested to inform the property in advance if they require any of the following: * different bedding configuration, * a room located on a higher floor * a room with a river view * car parking (charges apply) * breakfast vouchers (charges apply) * late check out (charges apply) * rollaway beds (charges apply) These requests can be noted in the Comments Box during booking or by contacting the property using the contact details found on the booking confirmation. These requests are subject to availability and cannot be guaranteed. Please note that all rooms have a high step into the bath, which has a shower above it. Step stools are available from reception upon request. Reviews of M On Mary Apartment Hotel in Brisbane.